Since my ESXi hosts are upgraded to VMware vSphere ESXi 6.5, the vmkernel.log is constantly spammed with warnings reporting that the physical block size from my LUNs, provided by a FreeNAS storage, have an unsupported block size. I'm using FreeNAS-9.10.2 with iSCSI LUNs backed by a ZFS volume. The physical blocksize is reported as the ZFS recordsize which is 128K by default. 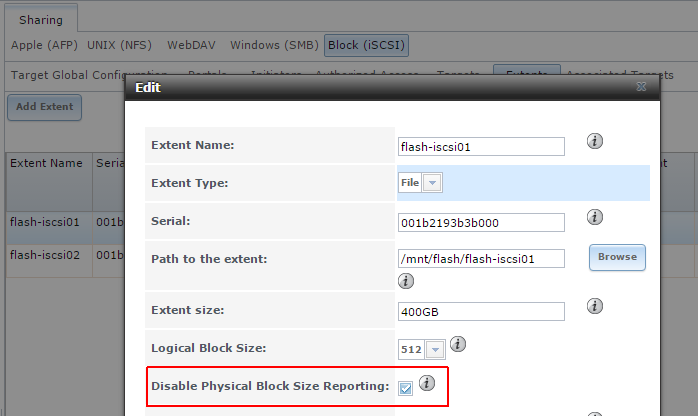 To get rid of the warnings, activate "Disable Physical Block Size Reporting" in the iSCSI Extent configuration. I have almost this same problem, and this didnt seem to change things. Is a reboot required after the change? No, a reboot was not required in my environment. Thanks, this worked for me. Just had to restart iSCSI service on FreeNAS appliance for the change to take effect.